Ask a beggar about money. Travel to the city of Markarth. Enter the Inner Sanctum of the Temple of Dibella. Steal the statue and return to Degaine for your reward. 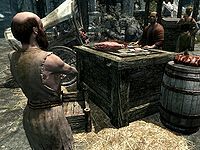 If you speak to innkeeper Kleppr or his wife Frabbi in the Silver-Blood Inn, they will tell you about the beggar named Degaine: "Degaine the beggar got himself kicked out of the Temple of Dibella. Caused quite the ruckus." You will then be given the objective to speak to Degaine, who can usually be found begging near the marketplace. Upon approaching him, he will express his interest in stealing a statue: "Aye, a whole heap of it. You see that Temple? Way up there. All them women, keeping to themselves. Won't let poor Degaine in, no. Not even for a look. But they've got a treasure in there. Gold statue, size of a child. Who knows what they use it for, but I know what I'll use it for." Inquire why he wants to steal the statue and he will tell you: "Well let's not put it like that. Wouldn't want the Thieves Guild catching wind of us, eh? Nah, just creep in and have a go at taking it out. I'll be here, and pay you half of what my man in Riften promised for it. You'll be helping out an old beggar, and the Divines smile on that sort of thing." The statue itself is located within the Inner Sanctum of the temple. This makes finding the temple itself easier, but is not necessary to initiate The Heart of Dibella quest. Upon entering the temple, you will find the priestess Senna, who will inform you that: "The sisters are communing with Dibella. They can't be disturbed. You'll have to come back another time." In order to access the Inner Sanctum, you can either try to pick the expert-lock, or steal the key from Senna. Note that if you choose to pick the lock and are not caught by one of the priestesses, you'll have to do it twice—once to get into the Sanctum, and once to get out. If you are caught by one of the priestesses, Hamal will confront you. You will then have the option to find the Sybil. If you choose not to do so, the priestesses will become hostile and attack you. If you kill them, you will be unable to complete The Heart of Dibella quest. If you successfully retrieve the statue, you can turn it over to Degaine who will hastily say: "Give it to me quickly, before they see us together. You've riled up the priestesses, and the guards don't take kindly to that. Here's your share. Nicely done." He then gives you 150 gold in exchange for the statue. At this point, in order to start The Heart of Dibella, you will have to return to the temple and deliberately get noticed. 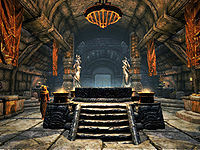 The Statue of Dibella differs from the common Dibella Statues found throughout Skyrim. Selling the statue to Degaine counts towards the Hero of the People achievement. If you have the 'Speak to Degaine' task, but instead talk to Hamal inside the temple, then immediately accept and finish the quest, you won't be able to finish the 'Speak to Degaine' quest. You can be given the 'Speak to Degaine' quest a second time, and the quest won't/can't update because you have already opted to steal the Statue of Dibella. Typing SetStage T01Intro 10 and then SetObjectiveCompleted T01Intro 10 1 in the console will remove this objective from your Miscellaneous quests. 10 Degaine the beggar has asked me to steal a chalice from the Temple of Dibella in Markarth. On the PC, it is possible to use the console to advance through the quest by entering setstage T01Intro stage, where stage is the number of the stage you wish to complete. It is not possible to un-complete (i.e. go back) quest stages, but it is possible to clear all stages of the quest using resetquest T01Intro.